Artists all over the world rely on art fairs and festivals to promote their brand and sell their products. Many artists depend on these events for their livelihood, and many do very well. According to the TETAF Art Marketing Report for 2017, over one million people attended the world’s top 20 art fairs last year. And projected sales for this year hover around the $45 billion mark. So when I tell you that art fairs are the best way I know to sell art, the numbers back me up. Art fairs and festivals can also help you build audience, create community, and command the attention of gallerists and curators. Put the research first. Preparation is your best friend because when it comes to art fairs, you can’t plan too much. Follow instructions. Artists are known for breaking the rules, but the place to break them is in your work, not in your professional submissions. Get organized and create a system to make sure all the details are covered. Pay attention to your brand when you exhibit. All materials should be created with your brand in mind. It’s all about consistency and authenticity. Don’t overhang your booth! Art fairs are overwhelming enough. Art fairs are an excellent investment, but think long term. Don’t invest everything you have in one art fair, there’s too many variables outside of your control. Promote your booth before and during the fair. Be sure to let people know where to find you. Share your excitement with your audience! Be sure to follow up on your leads because the best sales often happen after the fair. Stay positive, even when things don’t appear to be going your way. Remember that art fairs are a powerful way to build relationships – both with an audience and with other artists. You don’t have to be an exhibitor to get the benefits of attending a fair. It’s also important to see what other artists are doing, what galleries are showing, and finding work that inspires. So even if you don’t have any plans to exhibit in an art fair yourself, I urge you to visit art fairs whenever you get the opportunity. You’ll always find something to learn, someone to meet, and something to see. 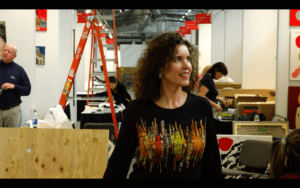 Do you want to learn more about art fairs and festivals? Art Fair Essentials will fast track you success. Honestly, there is like nothing else on the market. Click here to learn why. Use the coupon code ARTFAIRS and recieve $100 discount from tuition. That’s more than half! But hurry, offer ends soon.